An odd one. 82 kz750r1. Well, starting a thread. I obtained my first motorcycle in February of 2012. It was a 77kz650 4. It ran poorly, I decided to turn it into a project and bit off more than I could chew. It was a learning process that's for sure. 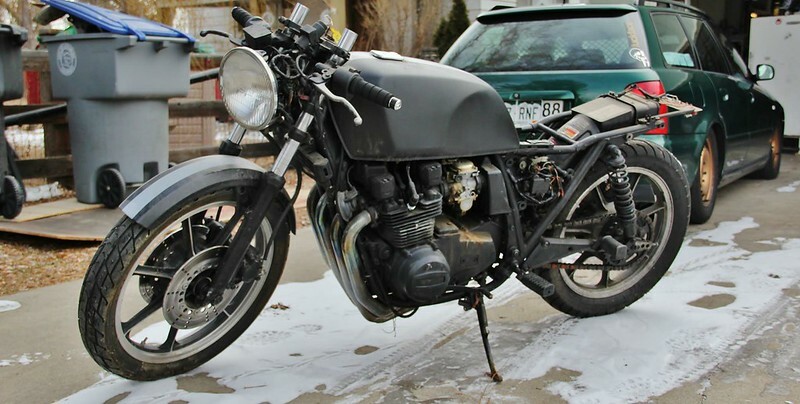 By dumb luck a few months later I picked up a 83 gpz550 for nearly free. I was trying to cobble 2 bikes together out of 1. It was a disaster. I ended up giving everything away to a friend. 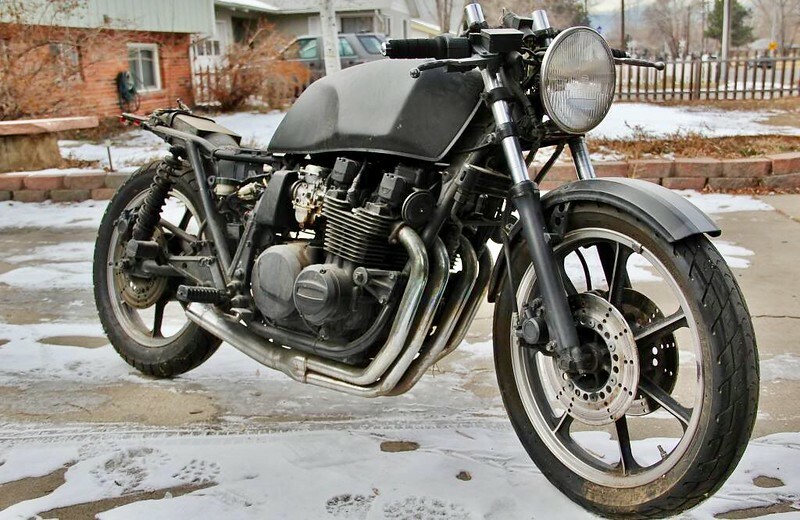 I then picked up an 82 kz750r1. 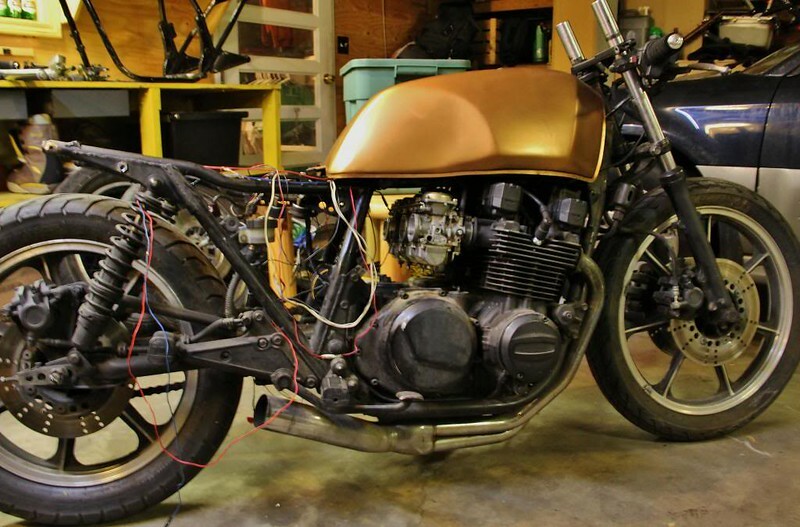 It's a one year only production motorcycle and was blend of the kz750 4cyl and the gpz750. Wikipedia tells me it was the fastest 750cc production bike of 1982, which I guess is sort of cool. It ran in January 2013. Just now picking up where it was abandoned. Looking to do something right this time around. This is about the condition I got it in. 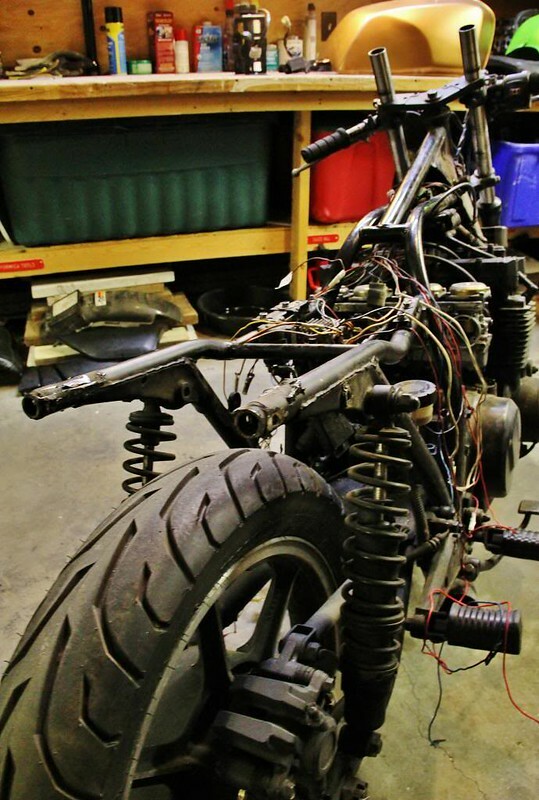 Leaking fork seals, lack of seat, gummy carbs, leaky front tire, butchered wiring, and well. Ugly. 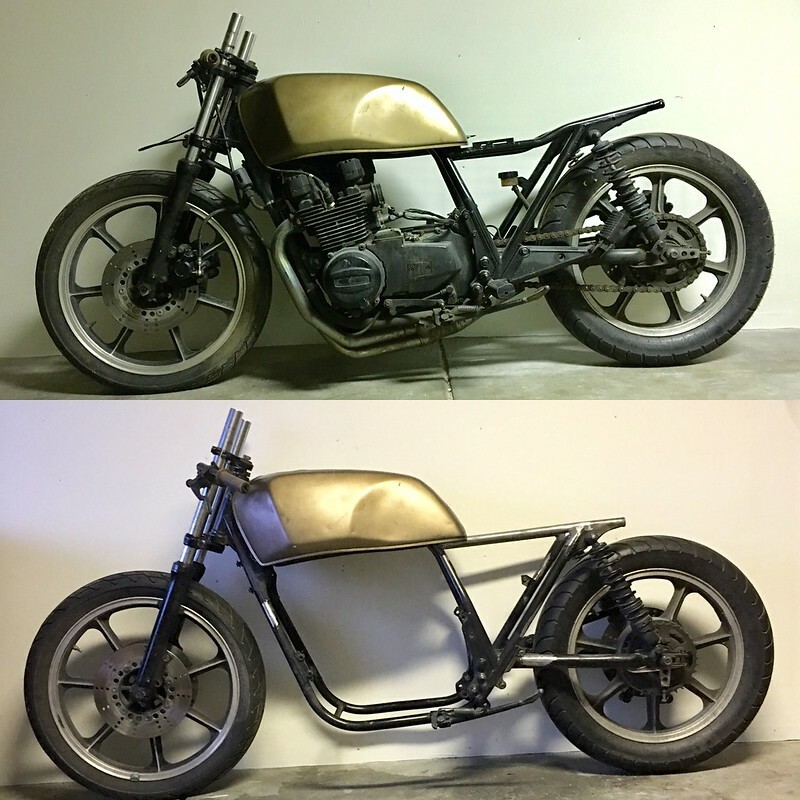 I've always liked the cafe racer look, with flat seat, and no rear cowl. So does that make it a brat-cafe? 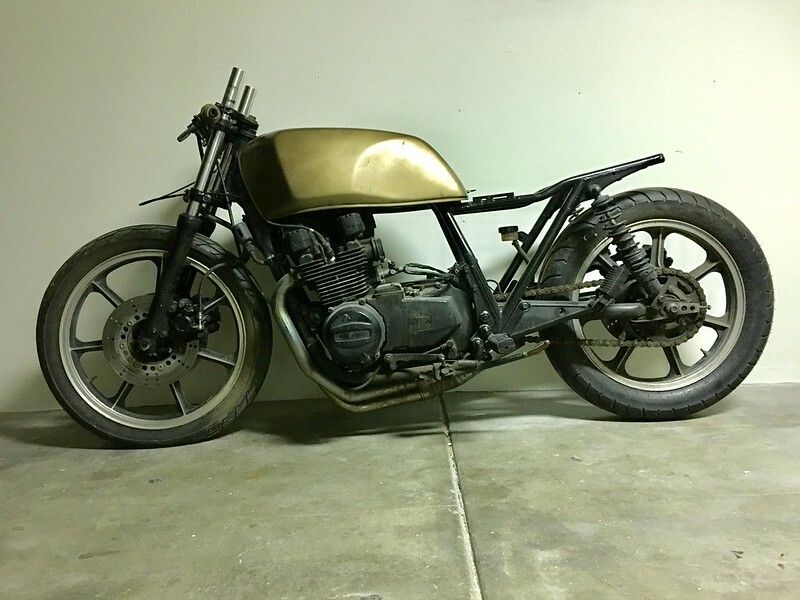 After going to the HandBuilt show and MotoGp in Austin last year, I got a healthy dose of motorcycle. Seeing the "musket" bike Maxwell Hazan provoked something inside me. 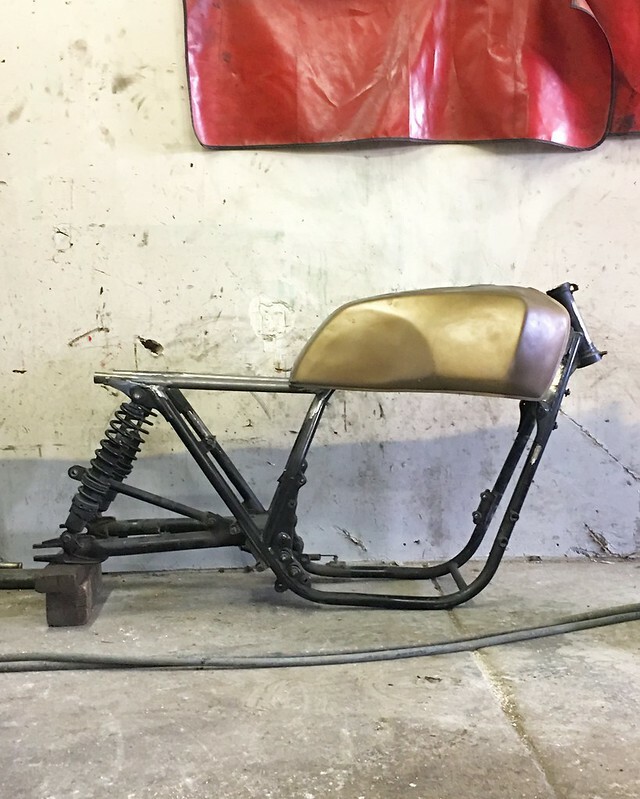 I've also been a huge fan of the auto fabrica bikes from the Uk, and everything they produce inspires me as well. A blend of design, simplicity, and ride-ability is what my long term goal is. Changes are taking place. Re: An odd one. 82 kz750r1. Brat cafe. In my eyes redemption comes in the form of an early 80's superbike replica. Feel free to take some liberties with design but that "sit up and beg" design is the key to a well executed bike. Oddly, that route it much more unique in reality than the brat look, which is very played out at this point. This is kind of where I'm picking up from. 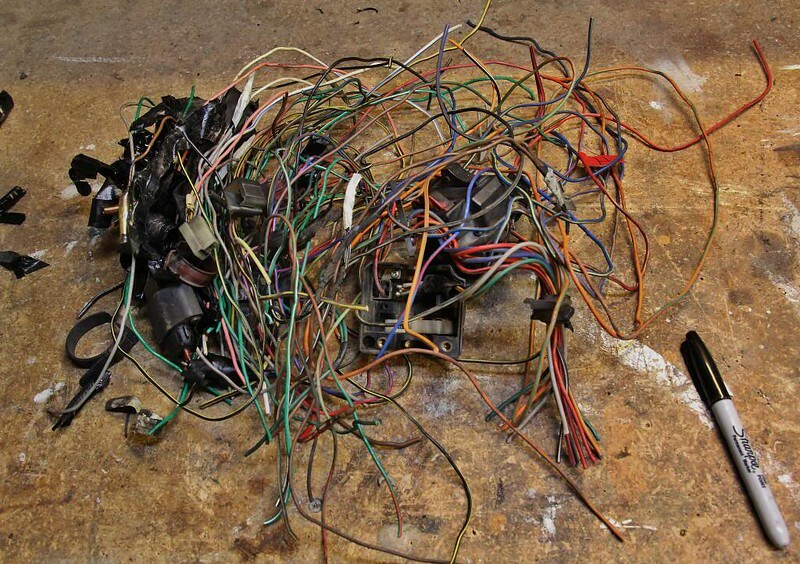 A while back I removed about 85 percent of the harness (previously hacked..bad news), made some cuts to the rear end, and cleaned out the carbs and made it run off a simplified harness. It needs serious changes in the jets and nearly every gasket in the carbs refreshed. I know what you mean. The main problem with that is, I've don't appreciate the early superbikes near as much as I should. The gpz's are cool bikes, but it just doesn't work aesthetically for me. Certainly not. One of the triple tree clamps was also broken off.. No thanks to the previous owner. I would like to bring the front end down some. Was kicking around the idea of using a 06-07 gsxr 750 front fork and triple tree set up. There's a lot of cost involved to do that and have proper wheels. Not sure if that's something I want to dive into right now. I've also thought about just cutting the springs some and running a spacer when I put new fork oil and seals in. Certainly not. One of the triple tree clamps was also broken off.. No thanks to the previous owner. I'd would like to bring the front end down some. Was kicking around the idea of using a 06-07 gsxr 750 front fork and triple tree set up. There's a lot of cost involved to do that and have proper wheels. Not sure if that's something I was to dive into right now. I've also thought about just cutting the springs some and running a spacer when I put new fork oil and seals in. Neither of those mods really accomplishes anything except to upset the handling of a bike. Cutting springs is really a bandaid for improperly tuned suspension. Adding USD forks is again totally unnecessary and costs quite a bite more than a proper period fork swap with some upgraded calipers. What is the vision for this bike? Well aware that both of those changes is counter productive to handling. One of my friends has an ls650 with shortened springs and I didn't mind riding it at all. Even though I live in Colorado, I'm not going to be aggressively riding in mountains/canyons. I had to hold together a good friends body parts after a motorcycle accident from reckless riding. Not keen on it. Just around town and maybe to work and back sometimes, which is 18 miles one way. Ok so it's yours and do what you want. Neat bike originally. I'd agree the brat flat seat whatever is pretty played out. Way too many instawanna's built them going for imaginary cool points. Some did them really well, most not so much. Early superbikes are the coolest imho. Since you are just getting into bikes, do some more searches for Eddie Lawson replicas, Wayne Rainey, Wes Cooley, etc. These are timeless and the internet will love you for building them.